BACKGROUND: Scotch thistle is a native of Europe and eastern Asia and is probably an escaped ornamental. Scotch thistle stands are dense and practically impenetrable due to the weed’s spiny nature and large size. It spreads by seed and generally inhabits moist sites or drainages in dry locations. DESCRIPTION: Scotch thistle is a biennial that grows up to 8 feet tall. The plant forms a rosette of leaves the first year, and produces a seed stalk the second year. Leaves are large (up to 2 feet long and 1 foot wide) and strongly armed with spines, and the blades form conspicuous fringelike extensions along the stem. The entire plant is finely hairy to woolly, giving it a silvery-gray color. Flower heads develop in midsummer in groups of 2 or 3 on branch tips. Flower heads are globe shaped, upright, intensely spiny, and up to 2 inches in diameter; flowers are purple. Seeds are slender, smooth, and plumed. 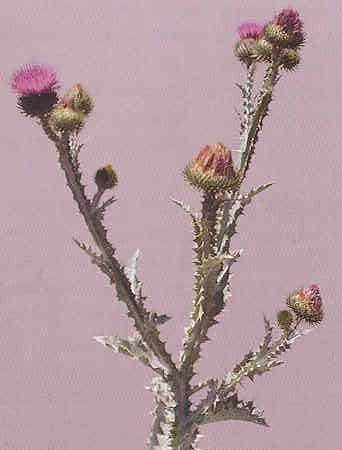 DISTRIBUTION: Scotch thistle is widely but sparsely distributed in the U.S. and throughout Idaho. CONTROL: Biological control agents are not available, but herbicides can provide excellent control of this weed if applied to very small plants.